SpaceX is rapidly changing what is possible in space. Instead of taking 40 launches over a decade to build the 400-ton space station, we could have 1000 launches in a year from ten fully reusable SpaceX BFRs that would place 150,000 tons into space. The 1000 SpaceX BFR launches would cost $10 billion versus $40 billion for the space shuttle launches of the International space station. We will be getting 1000 times the capability in space. 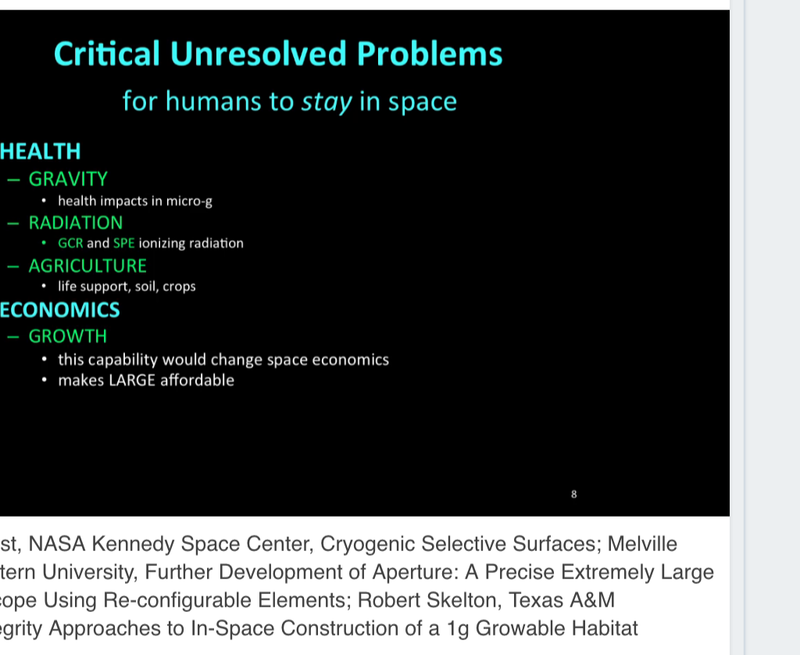 The most technically challenging aspect of designing a growth-capable space habitat is growing the pressure hull. 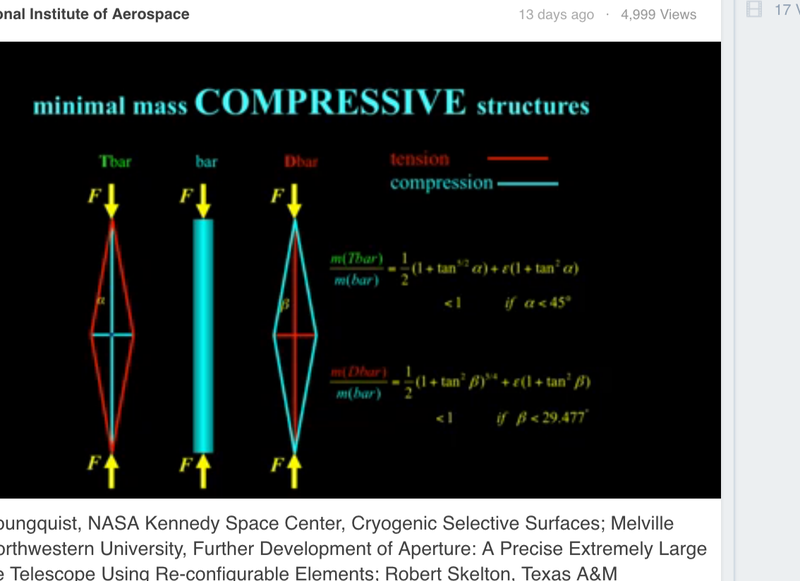 One method of growing a torus-shaped pressure hull is illustrated in the animation shown here. In this method a new folded pressure hull is constructed inside the existing pressure hull. When the new hull has been pressure tested, the existing hull is removed and the material recycled. The new pressure hull is then expanded by a controlled release of the restraining cables. 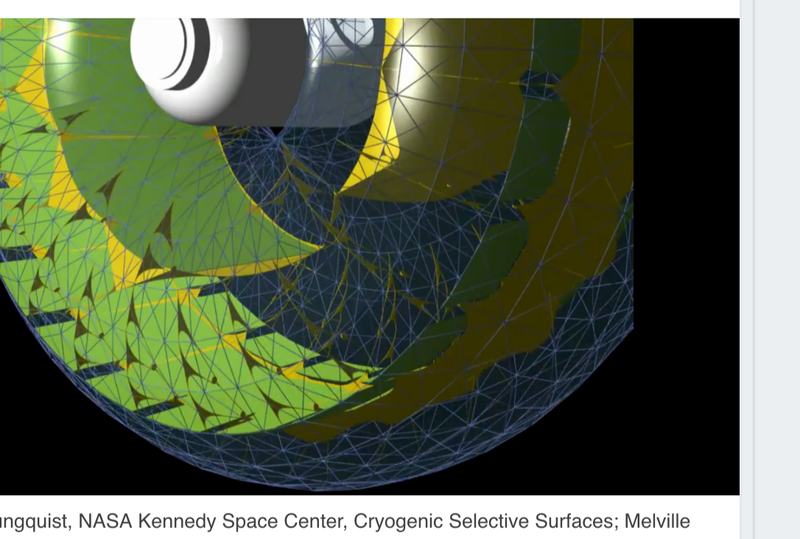 The animation shows one way of folding the new pressure hull to enable proportional growth where every facet of the torus grows by the same proportion, resulting in a uniformly scaled expansion. The 1975 Stanford Torus was engineered with a 1-inch thick aluminum pressure hull to hold air at 1-atmosphere pressure and house a population of 10,000. The Stanford Torus was conceived to be built using materials launched from large infrastructure built on the lunar surface, and would have had a mass when completed of about 100 million tons with only partial shielding coverage against ionizing radiation. A tensegrity engineered UHMWPE pressure hull of the same dimensions and pressure capability has a mass only 6% of the aluminum hull, or 17 times less. The Skyframe habitat’s initial deployment would require perhaps 2 to 3 ground launches and 3500 tons of water shielding to give full coverage to 1-meter depth, sufficient for 6 month stay time, scalable as required for longer stay times. A Skyframe tensegrity torus pressure hull of 10m major radius and 5m minor radius would have a volume of 5000 cu.m and a mass of 1.6 tons. 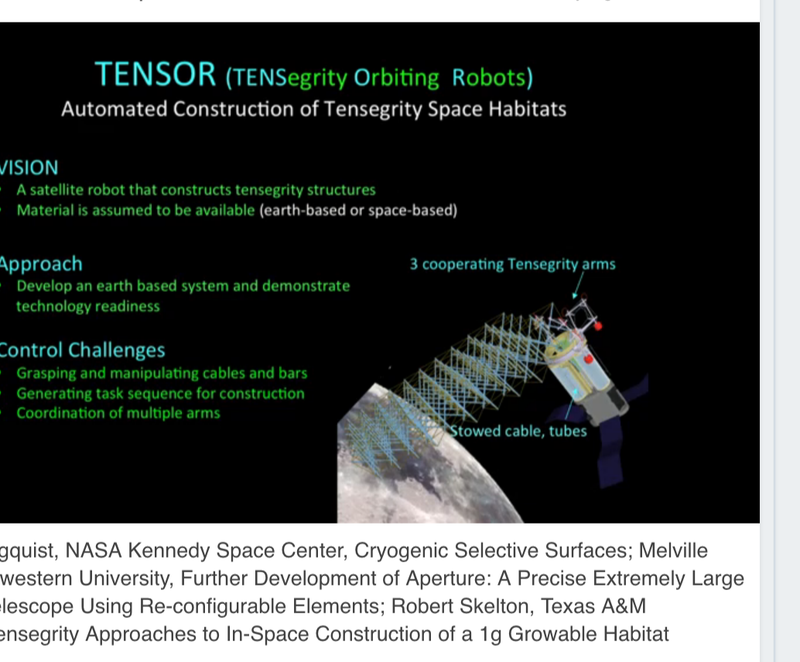 A 2016 phase 2 NASA NIAC study looked to design a rotating habitat with a robotic system that constructs the structure and provides a habitat growth capability. 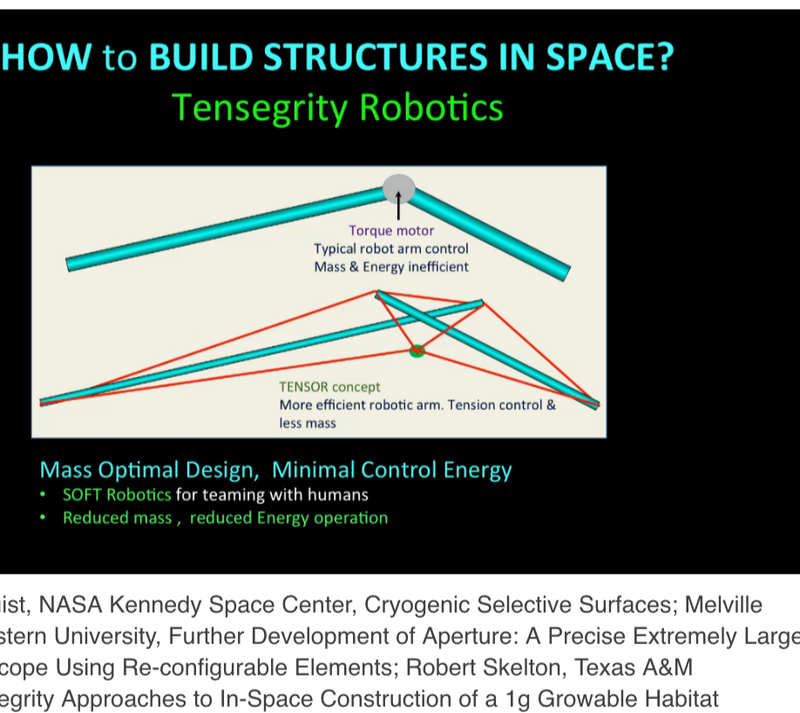 The tensegrity technology allows minimum mass of both the habitat and the robotic system. 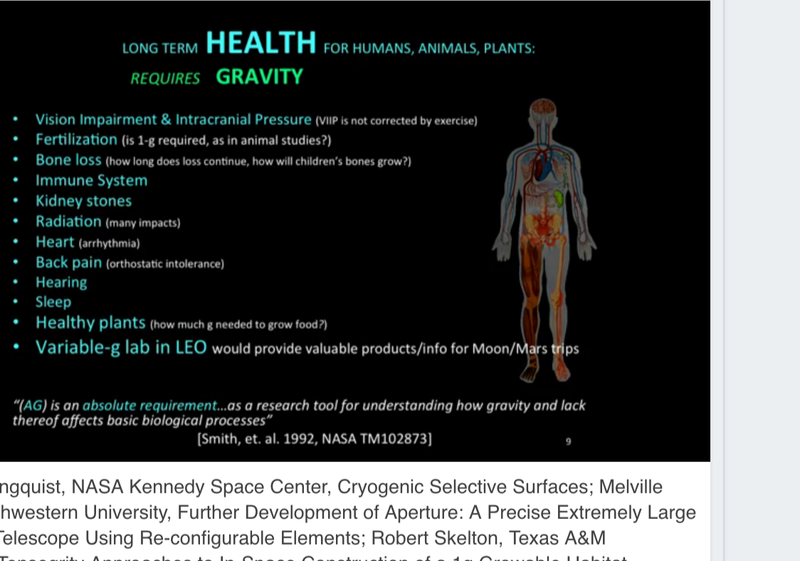 This proposal solves three unsolved space travel problems: a) growth, b) radiation protection, and c) gravity. 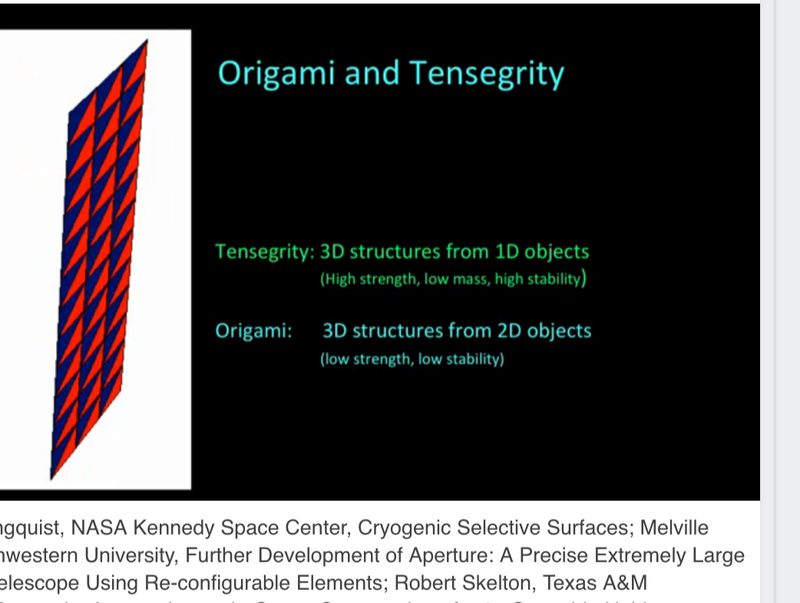 Our innovative tensegrity-based evolvable habitat designs will solve three critical technical problems that NASA must address: the biological effects of microgravity on humans in long duration space flight, the long duration biological effects of ionizing radiation on human physiology in deep space (beyond the Earth’s magnetosphere) and, the need for outposts in deep space to evolve dynamically over time as mission needs grow. Our technologies fit hand in glove with NASA’s new strategy and will be a key enabler in making NASA’s vision of pioneering the space frontier a reality because they are the only economically feasible approach to building habitats that can grow, spin, and manufacture in space. This NIAC Phase II effort will perform critical proof of concept studies, analysis, and ground demonstrations to prove the feasibility of Growth-Adapted Tensegrity Structures (GATS) and their benefit for NASA’s evolvable proving ground approach to human exploration. As part of this effort we will conduct mission studies showing how a version 1.0 outpost in Lunar Distance Retrograde Orbit (LDRO) made from GATS can grow and evolve while utilizing asteroid resources for radiation shielding and later integrate with an asteroid ISRU system such as the NIAC funded ApisT M architecture proposed by Sercel. We will perform mission analysis in collaboration with Sercel showing how asteroid regolith slag left over from the production of rocket propellant can be accumulated over time in LDRO and integrated as radiation shielding into the structure of the GATS based evolvable outpost thereby saving many billions of dollars in launch costs and helping to make NASA’s program of human exploration more affordable. The critical enabling technology for our GATS technology is Tensegrity Engineering, where new design methods, new dynamic models, and new control approaches are specialized for networks of axially-loaded elements, allowing the structural mass to be minimized, while the dynamic response can be controlled with minimal energy, with repairable, growable structural methods, using tractable analytical tools that are now available. We also capitalize on asteroid resources for radiation shielding of our habitat. 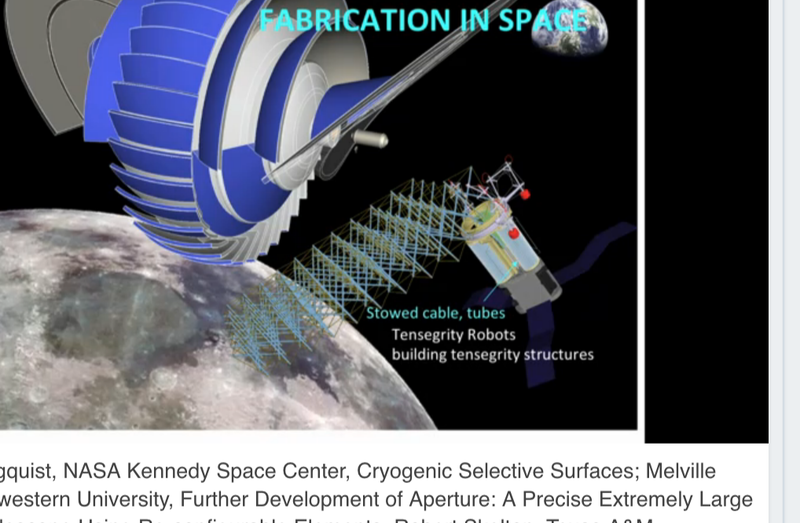 This NIAC Phase II effort will perform critical proof of concept studies, analysis, and ground demonstrations to prove the feasibility of Growth-AdaptedTensegrity Structures (GATS) and their benefit for NASA’s evolvable proving ground approach to human exploration.